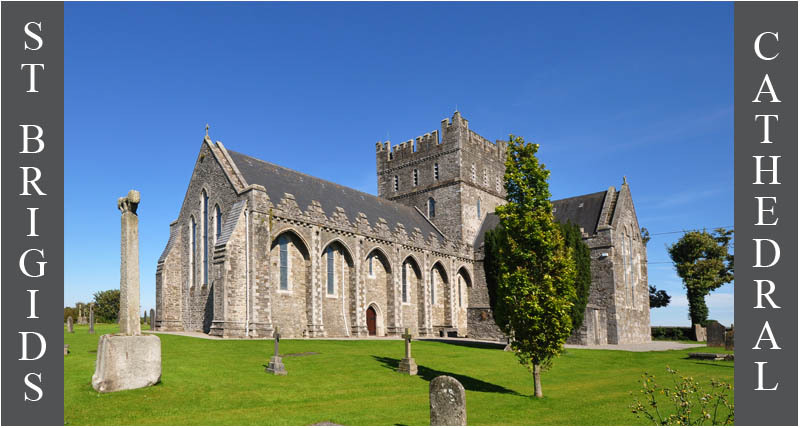 It is believed this beautiful Cathedral was built on the same site that St Brigid founded her nunnery in the 5th century. 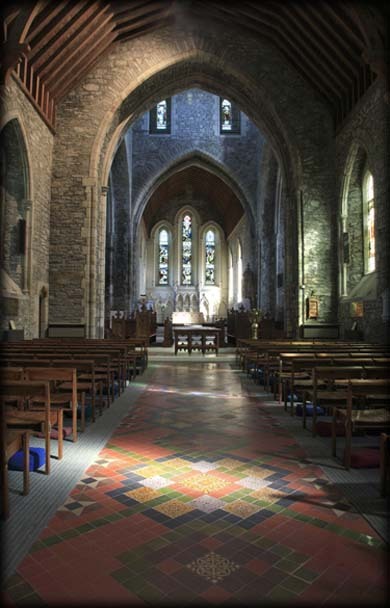 The Cathedral, which now consists of a nave and chancel church with a square crossing tower and transepts, was rebuilt between 1223 and 1230 by the first English bishop Ralph of London. 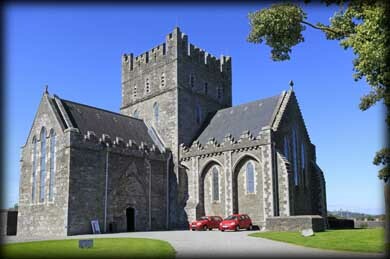 Many restorations have taken place to the Cathedral over the centuries. It was hugely restored in the late 16th century when the roof was pulled down and parts of the chancel, tower and north transept collapsed. It was almost entirely rebuilt in 1886 and the external buttressing was added to the nave and chancel at that time. Before entering the Cathedral, we wandered around the grounds visiting St Brigid's Fire Temple and 32 metre high The round tower. Also present on the church grounds was the plain granite high cross pictured left. It stands 3 metres tall with a damaged ringed head and a tapering shaft mounted on a square base. The real treasures lay in wait on the inside. From the moment we entered the cathedral we were surrounded by a rich assortment of beautifully carved cross slabs, grave slabs, effigies and tomb chest. 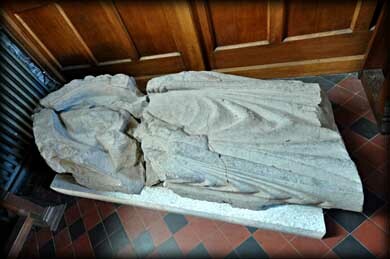 One effigy was of a bishop and another resembled a knight. Dotted around the walls of the chancel were more highly decorated cross slabs and some medieval floor tiles. One of the most striking features inside the Cathedral was the tomb chest of Walter Wellesley, a former bishop of Kildare, pictured above. The tomb chest was originally located at Great Connell Priory before being moved to St Brigid's Cathedral in 1971 for preservation. 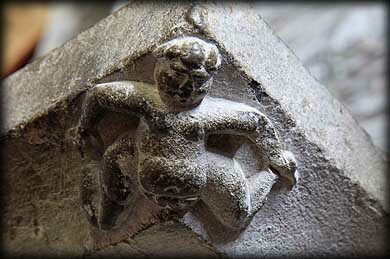 On the underside of the capital is the a small but stunning female exhibitionist figure pictured below. 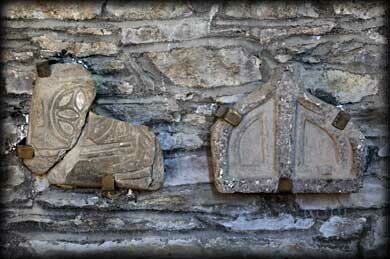 It is often referred to as a sheela-na-gig, but like the figure at the Nuns Church in Clonmacnoise it is an exhibitionist and not a sheela. 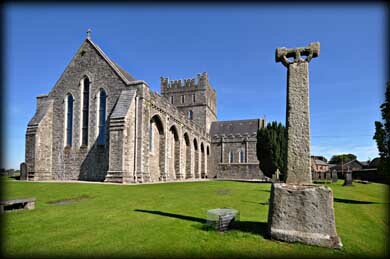 Situated: The Cathedral and High Cross are located in the Market Square in the centre of Kildare Town. Discovery Map 55 N 7280 1249: Last visit Sept 2012.